Today I finalized a design for a set of steps for the RETROpad. The problem was, once I jacked up the front end to make it level, that top step became dangerous. The construction is sturdy, easy and cheap ($70 total), but the math was tricky. 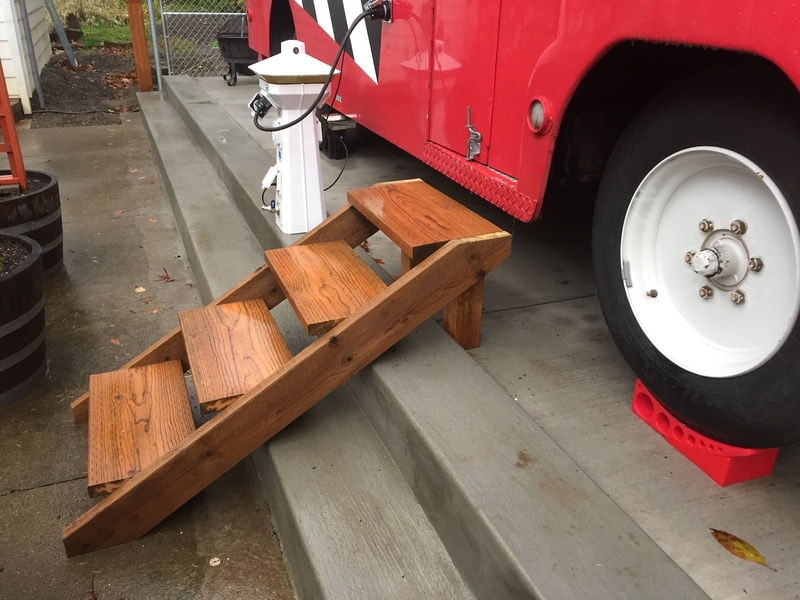 Each 12-inch step will rise 7 inches at a 30° incline. 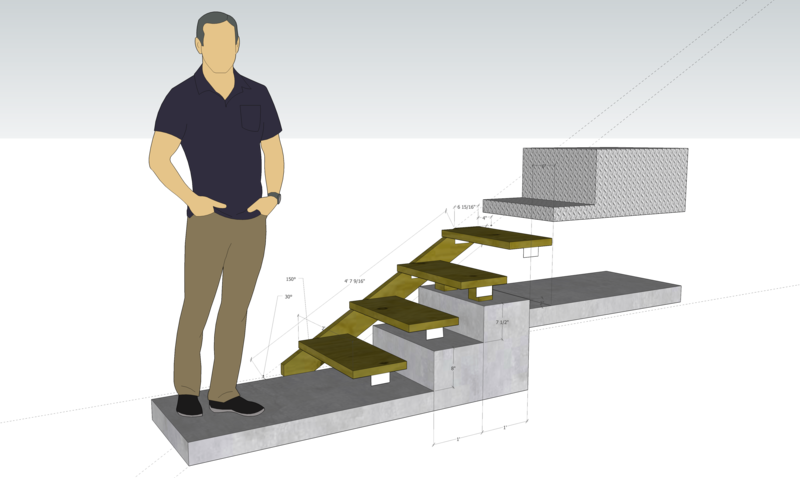 The 2×12 steps will be two feet wide, secured with 2×4 galvanized steel Simpsons Strong-Tie brackets. The third step will rest atop the concrete curb on short 4×4-inch posts to create a cantilever. And that means the steps will never contact the RETROvan’s hull. I also placed my Blue Sea Systems order for the custom helm labels. Today I’m planning another Home Depot run, followed by more electrical and plumbing work. I need to run cables through ceiling panel T7 and replace the refrigerator socket with another GFCI wall outlet. I also have to figure out how to best hide some cables feeding the TV and its mount. I just about broke both shins when I walked up to the top step and it seesawed on me. I had thought I could put the support under the third step and it would be heavy enough to not act as a fulcrum. But no—physics always wins. So I went to Plan B and put two 4×4 posts under the top step. I don’t really like the look but maybe I’ll improve it later. I’ve finally learned that math can only get you so close when you’re working with nominal lumber. I found variances of up to 3/16″ in these boards which kept throwing me off. So I wound up doing most of it by eye and averaging out the errors. I’m pretty happy with the way it turned out, and it’ll make the RETROvan that much more accessible. Previous PostPlumbing SucksNext PostElectrical? Check!